Discussion in 'General' started by steve00136, Jan 29, 2019. 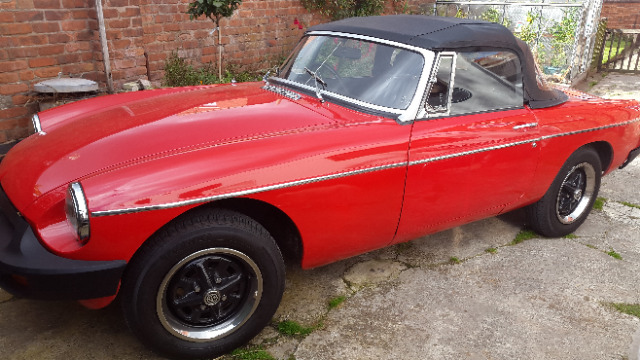 I bought my mgb roadster about a year ago and based on a bit of research and info from a recent previous owner would appear that the car was used for racing or track days. It had a stage 3 head, high lift cam and a performance exhaust which that owner removed for normal road use - it still has a 7/8" antiroll bar fitted and I have just replaced the gearbox selectors that were totally shot giving very sloppy gear changes. During the period 2004 to 2014 it was sorned off road yet covered nearly 2000 miles mainly 2004 – 2005 (owned by an Ian Ripley) and 2011 – 2013 (owned by a Mike Lawton). Have tried contacting these owners but no response (poss moved on or not interested). Just wondering if anyone could remember such a motor (reg no LST74P - manuf 1975 - red) as would love to get some pictures of it in its “racing” mode. Picture of it attached – it also had a walnut dash. May even be tempted to have a go myself! Steve you really should scratch that itch! Have a blast. My first MGoT day was in my factory standard Mark 1 roadster at Goodwood, it seemed like a very fast car to me, great fun. mgbjohn. yes i will be checking out the track day / competition clubs at the shows this year with more interest with the view of possibly participating. I am a fairly new member and can not recommend this club highly enough the track days are well hosted and ability graded so you have a great day all members are approachable . Goodwood last year was amazing . Just do it ! i have been keeping a blog of the work and repairs i have done to the car at www.mymgb.info ......most of it putting right what 2000 miles of track days or racing has done to it by a PO. Still might give it a go but at a more leisurely pace.